Once again Lenn Thompson of LENNDEVOURS (now New York Cork Report) and Tim Elliott (of Winecast) have resurrected Wine Blogging Wednesday (WBW). Hatched in 2004 by Lenn, each month a different blogger “hosts” a virtual tasting by developing and publicizing a theme. Participants write on that theme and post the results on their blogs on the designated Wine Blogging Wednesday and let the host know. Then the host posts a summary soon after linking to the participating blogs. Wine Blogging Wednesday seemed to run smoothly enough for about five years then it ran out of gas. (See my December 2010 posts about whatever happened to Wine Blogging Wednesday.) WBW was tuned up, but again seemed to be headed for the junk yard when Lenn and Tim Elliot responded to continued interest by myself and others as well as a conversation on twitter about whether Drunken Cyclist’s wine round-up with voting for best post could replace WBW and conversations on Facebook among women wine writers about how we’d run it.. So where are we headed for Wine Blogging Wednesday #80 on Aug.14, 2013? Dry Roses! As Tim points out, versatility is dry rose’s middle name and it’s the perfect wine for summer’s sun. It’s great cold with summer picnics and lighter fare but it also works with heavier meals including my favorite, ham (and basically anything pork!) Tim suggests that we travel further than we usually do and explore a new dry rose. Want to join the fun? It’s easy! Open a bottle of the dry rose of your choice (there are plenty out there–just make sure it’s DRY!) Post your entry on WEDS AUGUST 14 and, send Tim your link via email (winecast at gmail dot com), Twitter (@winecast and please use hashtag #WBW80) or post in the comments on Tim’s blog. I’m not sure what I’ll open that I haven’t written about before…but I now wish I’d picked up a bottle of rose while I was in Canada because I tasted quite a few exceptional Canadian ones (as well as Cornerstone’s from Napa that was quite delicious!) 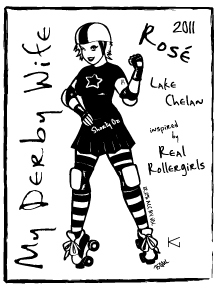 However, on my way to the Wine Bloggers Conference I did get a rose from Lake Chelan’s Blending Room Wine Girl “My Derby Wife” that would be fun to open and write about for WBW80–and it would give me a good excuse to write some more about Lake Chelan. So many wines to choose from! Thanks, Tim, for a great theme! (Read about the Vino V Rose pictured above. Read about a sparkling rose. Read about another sparkling rose). And what’s up for September? Lenn will host WBW #81 theme TBA for the second Wednesday of the month. If you can’t find the theme, check by here (or subscribe!) because I will do my best to post them each month with time for you to taste, write, and post by the second Wednesday. And hey–they might even let me drive my own WBW one of these days! Excellent – glad to see #WBW to be back! Coming up this Weds Aug 14 is Wine Blogging Wednesday #80! So check out this post for all the details and get your Dry Rose on this Wednesday! Summer, also known as the “Days of Wine and Rosés”. Cheers! Hey Monique! Thanks for participating and sharing! You want to also let Tim know by sending him the link be email or on his blog or twitter. It’s all there in the post.